Right before the Ramadhan Muslim fasting month, Eka and I got the itch to travel again, like we often do throughout the year. If you're a regular visitor to the foldingtales.com site or follow us on either of our instagram accounts (ekstagram/yellowscarab), you'll know that this is a constant problem for us. Our chosen destination this time: Siem Reap, the gateway to Cambodia's ancient past. 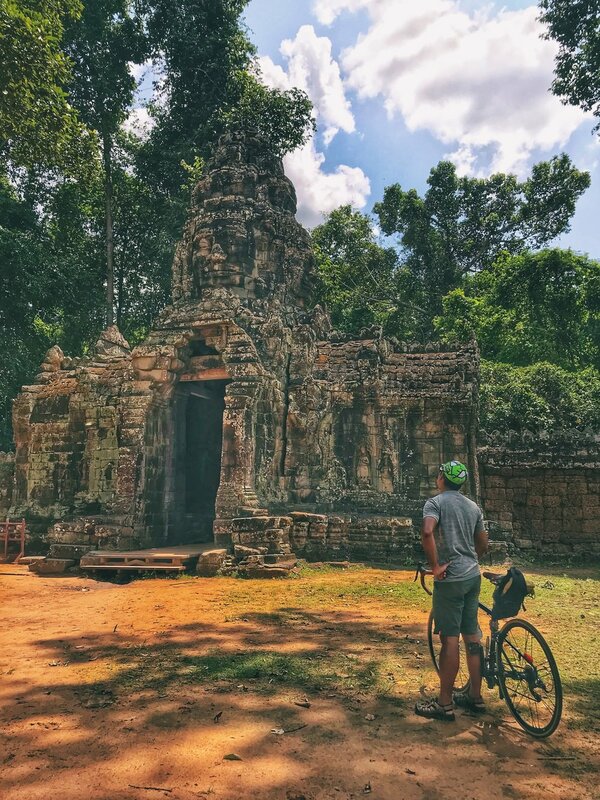 Having been there once already a number of years back, we knew that Siem Reap in particular would be great to explore on two wheels, considering the once quaint village is pancake flat and easy to traverse since the roads have not been developed much over the last few decades. Most of the main attractions are in the Angkor Archeological Park, which means that within a relatively small area it is quite easy to see all of the main sights in the space of a few days. We were also curious about how different the experience would be on two wheels. So when the 14th Malaysian General Election dates were FINALLY announced and we knew we had a small window for a quick getaway, we set about making the necessary arrangements. Siem Reap translates to "Siam Defeated", so is largely believed to refer to Cambodian King Ang Chan's defeat of the invading army of Thai King Maha Chakkraphat in 1549. While the origins of the name are unproven and can be generally disputed according to the date of the decline of Angkor and other things, there's no denying that it refers to the centuries-old conflict between the Siamese and Khmer kingdoms. The Europeans first set foot in Siem Reap in the late 1500s, but it was only in the early 1900s when the French set about clearing and opening up the site of Angkor. From then on, the city grew on the back of a healthy tourism industry, up until it buckled under the weight of civil war and the effects of the brutal communist Khmer Rouge regime. There are still scars from this tumultuous time in Cambodia's history, which you will see from the heartbreaking remnants at both the War Museum and the Land Mine Museum. Ever since Pol Pot's death in 1998 the city and province have been gradually recovering, and we've personally seen exponential growth over the past ten years alone. Some twenty years ago, my own sister found her way to Siem Reap, where you had to find a local villager willing to take you around on his motorbike (for a certain fee, of course). By the time I arrived with Eka five years ago, there was already a massive fleet of tuk tuks plying the road circuit around the Archeological Complex. Many of the locals had also been taught to paint artwork to sell to tourists, one of the many initiatives the government undertook to grow the tourism sector. There's a thriving cafe and hotel scene in the city, and a healthy number of people will speak enough basic english for you to get around without learning some words of the Khmer language. The food showcases Asean flavours similar to Cambodia's neighbours, with hints of influences from the French colonial era. Their flavour profiles are however somewhat more subtle than the likes Thailand, Indonesia and Malaysia, but with more exotic meats like crocodile (apparently tastes like chicken), tarantula (quite similar to crab, I'm told), and a collection of insects of different species. Much like my other travels around the region, I found our culinary adventures there a very interesting social comparison to the rest of the region. But let's be honest. There really is ONE reason that everyone heads to Siem Reap. Angkor, the sprawling UNESCO World Heritage Site containing the magnificent remains of the Khmer civilisation, is truly a must-see at least once in your lifetime. Even before walking through the gates of Angkor Wat, circling the moat outside, it always strikes me how the Khmer people built the massive site with no modern machinery. 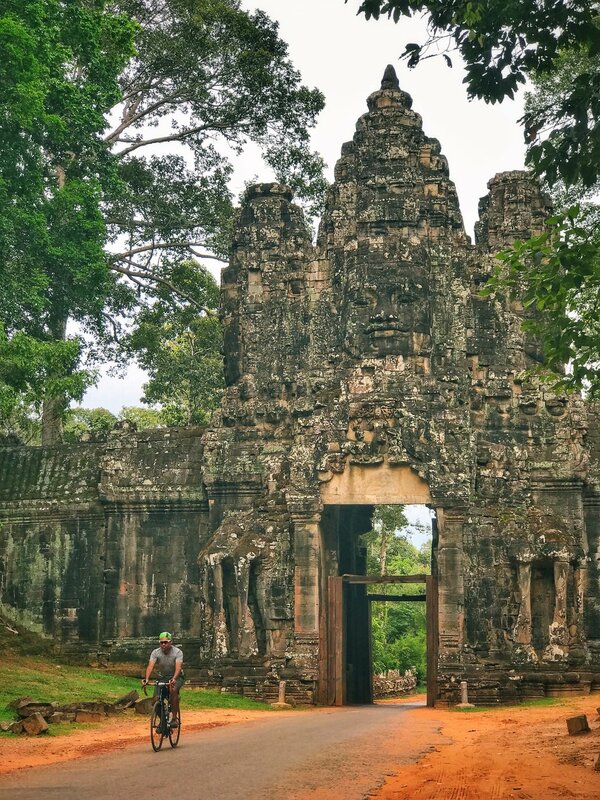 Here's the lowdown: the Angkor Archaeological Park covers about 400 square kilometres, and contains the remains of several capitals of the Khmer Empire of the 9th to the 15th centuries. There are many options for you to explore the entire site, but we've found the best option to be the 3-day pass. This ticket is valid for 10 days from the point of purchase, so don't buy it too far in advance. If you're there for a prolonged period of time, buy the pass on 5pm the day before you plan to visit, and you can still wander around and catch a sunset at one of the many different sites before you do a full three-day exploration. It's a really good way to stretch out the use of the pass. The last time we were there everything was done in cash and at a small ticket office, but these days even credit cards are accepted, and everything is digitised at a fancy multi-lane ticket centre (equipped with an ATM!) so they can take a picture and have it printed onto your pass. Not surprisingly, the pass is not transferrable and the staff actually check your mugshot upon entry, and if you are caught without it in the park there will be a penalty levied on you. Also don't forget to bring your passport when heading to the ticket office. Here is some handy information on the tickets. The tickets are kinda pricey, particularly after they raised the fees a couple of years ago. However, I try to keep in mind that a portion of the proceeds goes to charity, while the rest pays for the upkeep of the ruins. Remember that they are all in constant need of restoration, considering the entire site is exposed to the elements and have been for hundreds of years. Even over the last five years, we've seen a huge difference in the state of these sites. If you've had the random thought of going to see the remnants of a once majestic and grand kingdom, go as soon as you can before it disappears or degrades further. Restoration and refurbishment is always underway, but it is also lovely to see the ruins how they were discovered, overrun by nature and almost forgotten. We spent many long hours wandering around a number of different sites aside from Angkor Wat itself, and I definitely consider it time well spent. The central feature of the park is one of the largest of Khmer monuments and considered one of the finest monuments around the world, built around the first half of 12th century by King Suryavarman II. Theorised to be a temple for the worship of Lord Vishnu and the King's mausoleum, this is one of the most impressive temples we've seen in all our travels around the world. It definitely deserves its status on the UNESCO list. An almost square city surrounded by 8 meter high walls a little over 12 kilometers long with five impressive gopura gates. The city’s name itself translates to “large city” or “great city”, and some of the most famous and iconic ruins lie within its walls. The city was once thought to hold a population of one million. Each gate is topped by the face of Avalokitesvara, and is situated at an ordinal compass point and the Victory Gate in the east wall. There used to be a walking path on top of the walls that stretched 13km, but this was closed more than 6 years ago due to some collapsed parts. Built in Angkor Thom in the latter part of the 12th century by King Jayavarman VII, and famous for the 216 giant smiling stone faces of its 54 towers. Bayon also has beautiful bas reliefs depicting everyday life and historical events, as well as mythical figures and stories. Best viewed in golden hour, at least that's what we found. Famous for its cameo in Lara Croft:Tomb Raider, the second movie to be shot in Cambodia following the country's occupation by the Khmer Rouge regime. This is easily a favourite for many people, since the trees growing out of the ruins make it a very different place than its peer temples. After the fall of the Khmer Empire in the 15th century, Ta Prohm was abandoned and neglected for centuries until restoration and conservation work began in the early 21st century. Restoration is still underway today, with the trees allowed to continue living as one with the temple. Today though, wooden walkways and platforms herd the masses of tourists to ensure they don't damage the amazing site. Little Circuit (17 km) = covering several of the major and minor temples, from Angkor Wat , Angkor Thom, Ta Phrohm, and Banteay Kdei, and some of the minor but interesting temples like the Baphoun, Terrace of the Leper King, Terrace of the Elephants, Twelve Prasats, Spean Thma and Sras Srang. 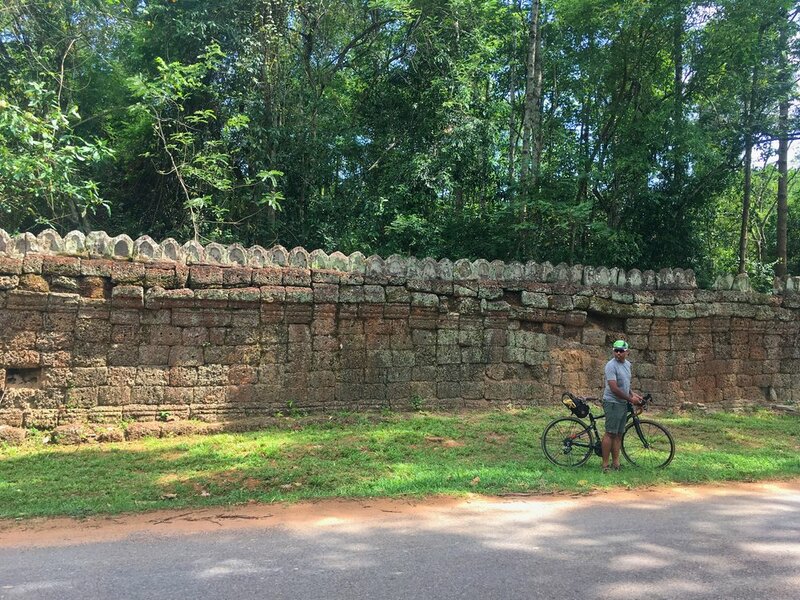 Big Circuit (26km) = an extension that also covers Preah Khan, Preah Neak Pean to the Eastern Mebon and the various monuments like Ta Som, Preah Rup, essentially covering different architectural styles from different ages in Angkor. As always, Eka and myself prefer to try and help the economy by patronising small B&Bs run by local families or entrepreneurs rather than opting for large hotels that are often owned by foreigners. For Siem Reap we wanted to be out of the city itself, but still be close enough that we had no issues finding food and other things like a bike shop, sundry store or money changer. Since the local tourist industry has developed well over the years, B&Bs and homestays are a dime a dozen there, especially with new digital platforms like Airbnb and the like. After an exhaustive search during which I was pushed close to exasperation and frustration many times, we found a lovely homestay 2km from the city centre that hit all the right points. Clean and beautiful rooms, spacious grounds that would allow us to set up and par our bikes safely, and a host who was attentive both online and in person. Run by Sokbo and her family, staying here was a great way for us to get an insight into the local people, food and environment. Sokbo's daughters will be playing nearby as you have your breakfast, so it is a child-friendly place as well. Sometimes Sokbo's husband will make an appearance after his morning jog, and have a chat with the guests at the massive wooden slab they use as a breakfast table. Natural Homestay had the feel of a boutique hotel or B&B if you wanted to be left alone to relax, and yet had the welcome of a homestay when you had meals in the main house. It was a little oasis in the middle of a somewhat barren space and is surrounded by red earth dirt roads that have not been paved. It's a bit alarming upon first arriving, but you will be glad you booked it once you reach the gates. There's a friendly stray dog which has adopted the family, and has been christened Lucky. He’ll be the first person to greet you when you arrive late at night at the gates, after a day of exploring. At the time, a small family of cats with several (hard to count since they were constantly running and climbing around) fairly newborn kittens had also taken up residence there. Also, the latest news we've gotten is that Sokbo has already built a swimming pool right in front of the rooms! What a marvellous way to cool down after a morning of traipsing around the archeological park. We'd barely been back for two months and the news made me want to book another flight there! Sokbo also gives cooking classes, which I did not realise at the time, so I guess I really will have to go back. We're planning on yet another visit, since Maya hasn't been to Cambodia yet and couldn't make it this round. If you’re bringing your bikes like we did, remember to try and keep your bike travel cases to the most compact and durable that you can find. Most of Siem Reap’s smaller accommodations will only employe tuktuks, which could barely fit our three bikes (as you can see from the pic). A swanky hotel may send a bigger vehicle to pick you up, but I think it’s fairly safe to say most other places will send you the local way of getting around. You may think this is a small matter, but it does require some pre-arranging. I was very clear that we had three big bicycle bags - one for each person - and Sokbo ensured that two tuktuks were waiting upon arrival. Having said that, the bags barely fit in a single tuktuk, and thankfully none of our bikes sustained any damage being piled up in that manner. Take the necessary precautions and pack your bikes with the proper padding and safeguarding any sensitive mechanical pieces. What bike should you bring? The roads in Siem Reap aren't exactly smooth tarmac, yet you will actually be doing a lot of cycling on the road itself. If you've specifically planned to go off road then an MTB hardtail would be fine, but I find that touring bikes or gravel/adventure/all road bikes with wider tyres for better comfort are the best option. These will be able to handle easily some parts of the road that are bumpy, while the 2km between the city and Sokbo's house did involve dodging potholes and some bump and grind sections on a road of packed red earth which had loose gravel and puddles if it rained. If you can handle the extra 5kg of a burlier MTB without exhausting yourself then it's no issue, but consider well the extra weight of the bike if you are on limited time to explore. 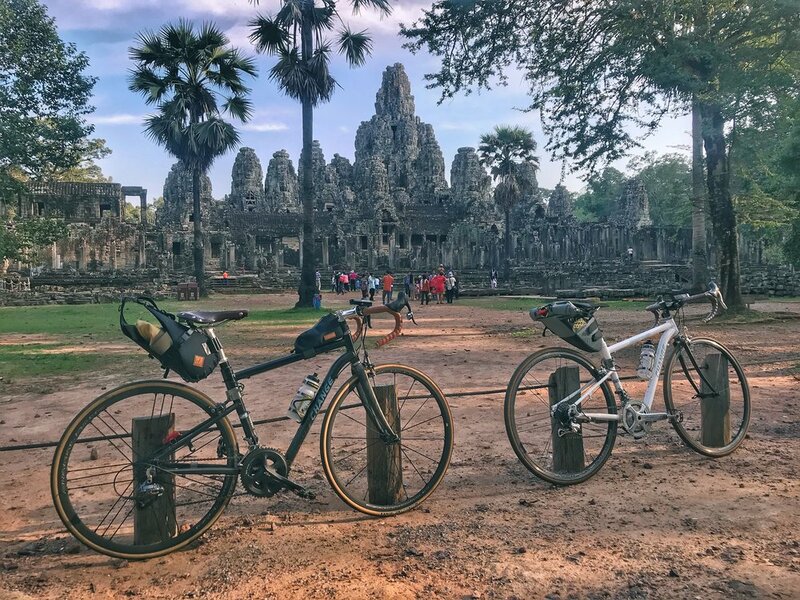 Remember that you'll be covering decent mileage in and around the big and little circuit around the Angkor area, particularly if you don't cycle as regularly as once or twice a week. Sure, if you don't want to bother with a bicycle, you could rent a tuktuk to take you around instead. For a day of tuktuk travel, Sokbo's guys charged USD15 for the four of us (if you notice in the pictures we had two more friends along for the trip, Ibah and Khai, who now and then we will manage to drag out for a ride back home). If you're planning to do this everyday there, it can get pretty pricey if you're not earning in USD. You'll also get the tourist treatment with a tuktuk driver i.e. sent to the fancier restaurants that could cost double or even triple what you could get from a roadside stall. Bike rental is available all over Siem Reap for pretty cheap prices, and even Sokbo has a mamachari or two available. Remember though that these often don't have any gears, which to be fair you don't really need because Siem Reap is completely flat terrain-wise. However, if you're a regular cyclist and used to gearing to help you get around, you'll know that these fixed gear or single gear type bikes can be a workout on their own because you literally have to pedal constantly to move. Unlike bikes with gears, there is no chance for coasting when you need a rest. Yes, they're expensive to join rather than exploring on your own and you don't have control over where they take you and what you'll see on the trip. However, it is a good way to get some interesting insights to the temples and what each is special for. Eka and I got a good understanding of the main sights after being reluctantly talked into getting a guide for a walking tour, but it turned out to be a good thing since they have a lot of insider information that you'd have to do a lot of research to know. There's also the added benefit of getting to ride all the way in to the doors of the ruins, or having the licence to stop and park where personal or rented bikes can't go. Spiceroads Cycling and Grasshopper Adventures operate a number of tours there, but there are others that are run and owned purely by locals, like the Khmer for Khmer Organisation. These guys aim to give free and sustainable education to kids and young adults from rural areas around Siem Reap. So, choose your tour company carefully and you'll be giving back to the local community, which is a good thing considering the economic level of most of the folks in the city. I don't think I am the only person to say that Cambodia could possibly be one of the more expensive countries to visit in Southeast Asia. I'll admit, the foldingtales crew hasn't been to all eleven nations in the subregion, regardless of whether they are a part of the official regional grouping. However, we've already made it to a few, and expenses are always at the top of the list of conversations when we trade notes with fellow travellers, particularly when discussing Cambodia. 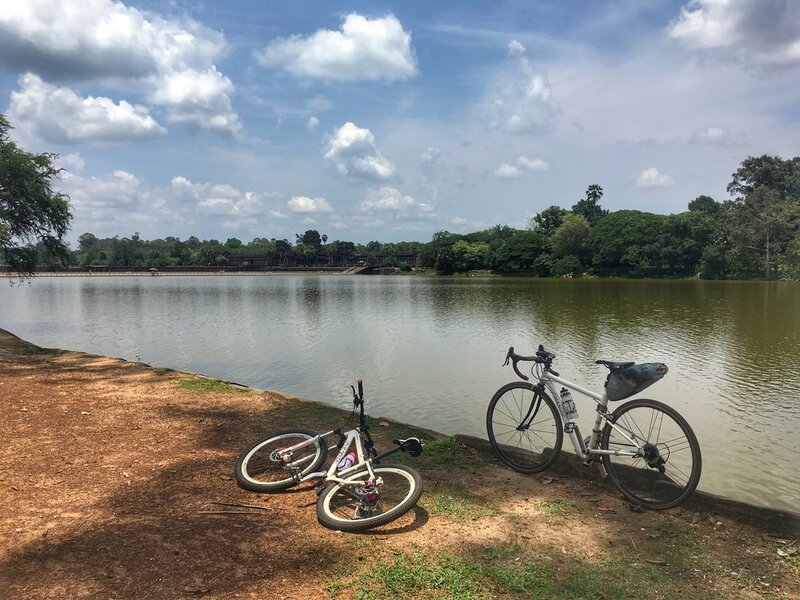 So when we decided to make a quick run to Siem Reap right before the Ramadhan fasting month, we thought that cycling would be a good way to cut down the cost of such a trip. For those of you who haven't been to Cambodia, the official currency is the Cambodian riel, but there is a 90% dollarisation level in the country. Essentially, this means that everyone uses USD there, and the riel is only given when your change is less than a dollar. No American coins are used, so the riel is utilised in its place. It is a weird double currency system that unfortunately makes everything there crazy expensive. To make it worse, the tourism industry has developed dual pricing for locals and tourists, who are particularly hit when it comes to transport and food costs there. Prices in our chosen destination Siem Reap, which is a well known tourist hotspot globally, are also considerably higher than the rest of Cambodia. Also remember to scrutinise all your bills carefully when you get them from the money changer, either before or after reaching Cambodia. Any blemishes or tears mean the local businesses won't accept your cash, and that's quite dangerous if all your money is rejected and they don't take credit cards. In the city you can have it changed again at the money changer, but they will charge you a fee to accept damaged bills. So, with all this in mind, we knew that cycling would be our main way to get around town once there. And who are we kidding, it was the main reason we went there in the first place!